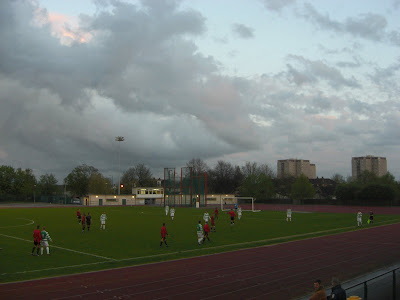 My twenty-fourth stadium of 2011 was on Monday 11th April 2011 at Erith Sports Stadium in Erith, London. The match was Erith Town vs. Corinthian in the Kent League Premier Division. Erith Sports Stadium is located around half a mile from Erith railway station and is part of a larger sports complex which includes a leisure centre. The stadium, which has been home to Erith Town since 1995, is multi-use and has a running track round the pitch. The venue is nearing the end of work to put a roof over the main stand and this was the first game to be held since the latest stage of construction. The ground's only viewing section is on the near side of the pitch. This mostly consists of the partly covered all-seater stand which can hold 1,000 spectators. Behind the stand is a standing area where you can also watch from. As there is only one section the venue's total capacity is just 1,450 although this is obviously not an issue for a club at this level. The turnout for the match was pretty average although the away supporters appeared to be in the majority. I arrived five minutes after the game started due to train delays at London Bridge, and so missed Corinthian's opening goal. I settled down in time to see Erith level with a penalty and the score remained 1-1 until half-time. In the second half the visitors grabbed two goals to head into a 3-1 lead but Erith were able to score two goals in the last 10 minutes to salvage a 3-3 draw.